This post is in continuation with a previous one; a part of my Kashmir Travelogue series. We arrived the day before; and spent this day sightseeing and indulging ourselves in a Gondola ride in Gulmarg. From Phase 2, we went trekking to beautiful Alpather Lake that I have detailed in this article further. To read previous part of this post, please click on the link below. 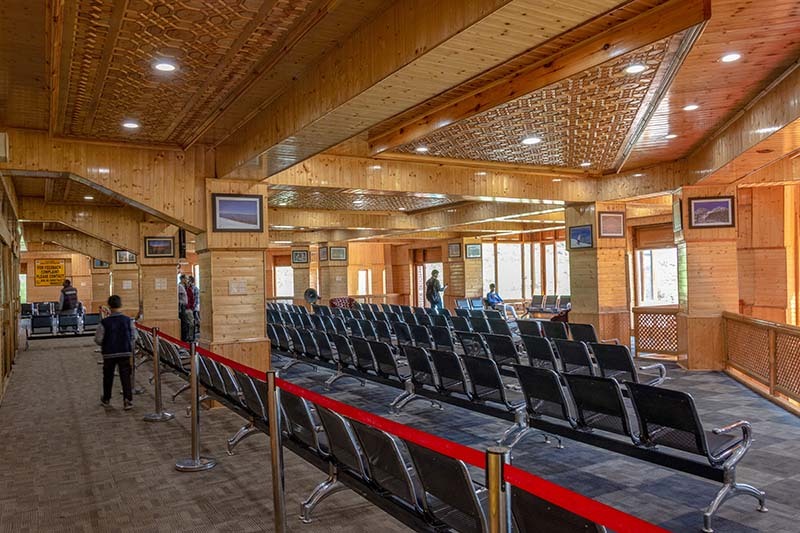 For a brief introduction, Gulmarg Gondola is one of the world’s highest operating cable cars; ferrying tourists from Gulmarg town to the top of nearby Apharwat Peak. A joint venture between the J&K government and a French firm Poma, this two-stage rope-way is capable of ferrying about 600 people per hour. It is divided in two stages; or more popularly known as two Phases. So popular it is that during peak tourist season; you may have to get in line and wait for hours before you will be able to board a Gondola. 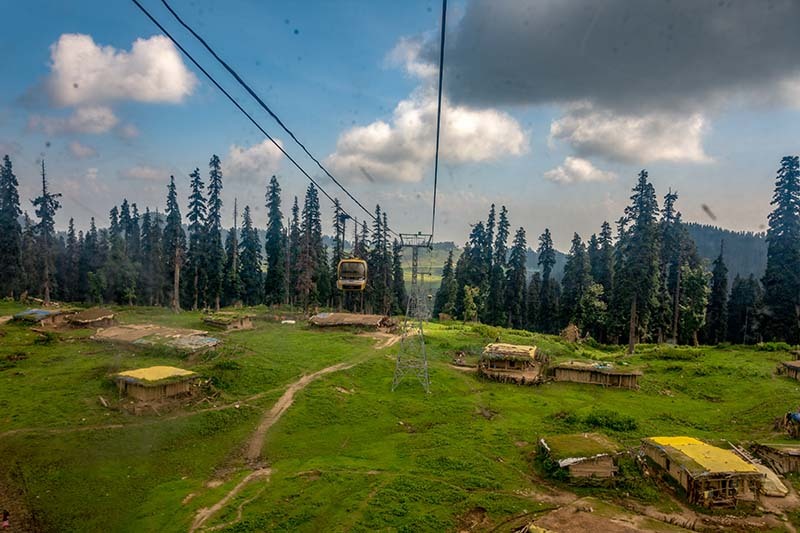 As a matter of fact, not just Gulmarg but a Gondola ride is considered among prime attractions of a trip to all of Kashmir. Our plan was to go all the way to Phase 2 and then trek to Alpather Lake from there. I initially thought to get a guide because I wasn’t completely sure about the trail that went to the Lake. All that we knew was that once we get off the Gondola at Phase 2, we need to trek and climb up to our right. This did not sound too convincing and I did not want to get lost in the hills in an area so close to the border; and so sensitive. Little did I know at that time that how easy the trek in fact was; and that there is also a motor-able road up there that we could just walk on. Anyways, I did not have to ask a guide because they all kept walking to us one by one; offering to show us the way to the lake for Rs. 1,200. This price then dropped to Rs. 1,000 after I said no, but even then it sounded a bit steep. In the end I just gave up the idea of a guide for now. Somewhere though I had this thought in the back of my mind that once we get off the Gondola at Phase 2, I will see if there is anyone that we could hire there. The guides at the start of Gondola were asking for a thousand bucks; but I was sure that they won’t ask so much for the last bit of the journey. I was under the impression that from Phase 2 to the lake, they will just ask a couple hundred bucks. So wrong I was. Finally the ticket counter opened and we bought our tickets for Phase 2. Important thing to remember here is to bring your ID cards because they asked us for it before handing over the tickets. DL, Voter’s ID, PAN or Aadhar card, anything would do. Below is how the tickets look like. For Phase 1, price is Rs. 740 and for Phase 2, price is Rs. 950 per person. To be honest, I do think that it is quite steep for a 10-15 minute ride. Yes, that is how long the ride usually lasts. Just about 10 to 15 minutes for each phase. To my complete surprise, there was absolutely no one else apart from us buying tickets that morning. After reading all the horrible reviews about how crowded the Gondola usually gets and how it takes hours for people to get onboard, this definitely came as a very pleasant news. It was just the three of us all alone. A Kashmiri family arrived a little later and bought tickets for Phase 1. 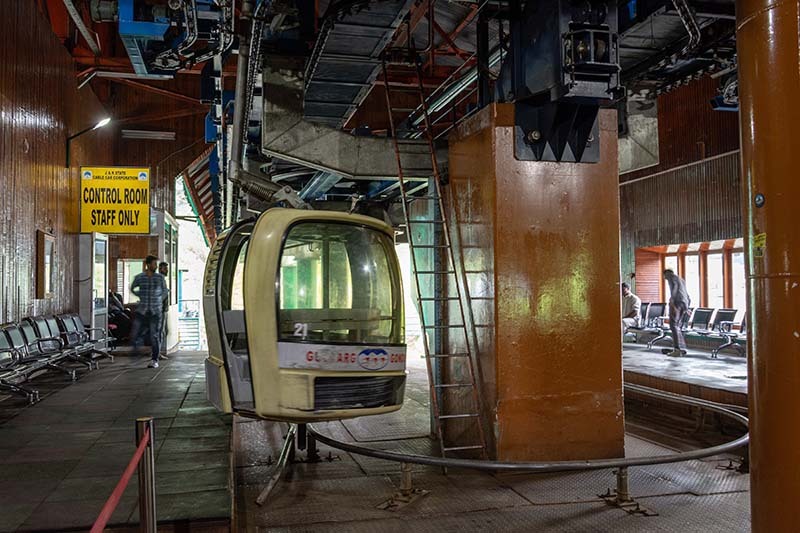 But for most part of it, the entire place looked deserted and the Gondolas moved vacant. Below is a picture of the boarding point for Phase 1. The Gondolas here do not really come to a complete halt but remain in motion at a very slow speed. The door will pop open and you will board it while it continue to move forward. So yes, keep that in mind and remain prepared accordingly. And finally the ride started. 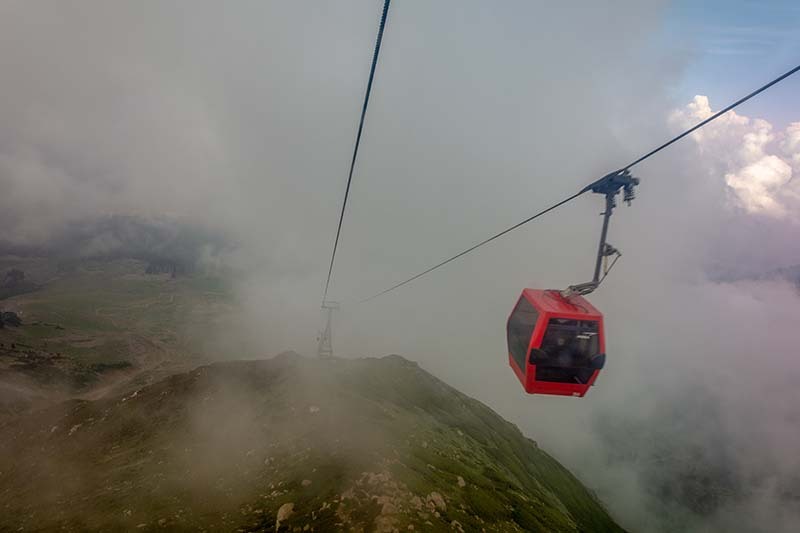 A couple of minutes into the journey and I realized why Gulmarg Gondola is so famous. The views that you get from up here are mesmerizing indeed. About 10 to 12 minutes later, we arrived at Phase 1. We walked straight to the second boarding point and got in a second Gondola for Phase 2. The view from here on got even better. I clicked a lot of pictures that day but most of them did not turn up good because they were all clicked through the dirty glasses of the Gondola lift. Another thought that kept rushing through my head sitting up there was about the 2017 accident that claimed 7 lives out here. Yes, that is right. 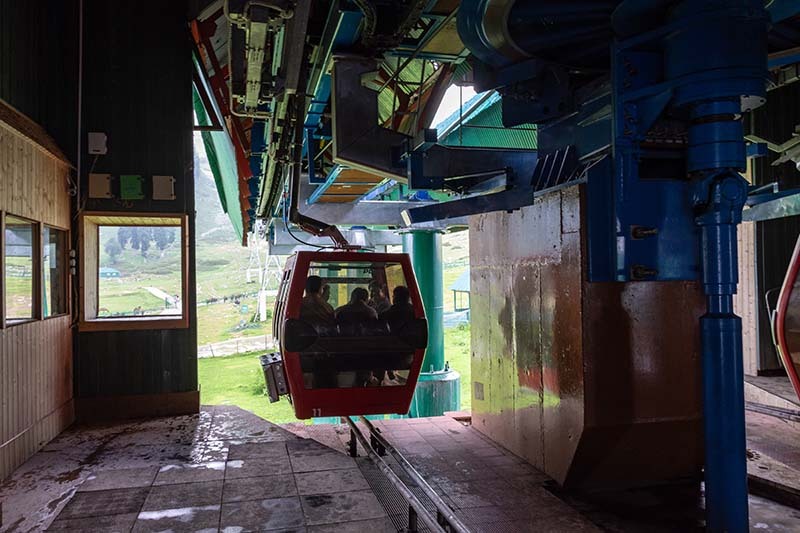 In case you did not know already, there was an accident at Gulmarg Gondola in 2017 that killed 4 tourists and 3 local guides. A tree uprooted and fell on the cable; swinging the Gondola so violently that the glasses broke and all 7 of its occupants fell out to their deaths. 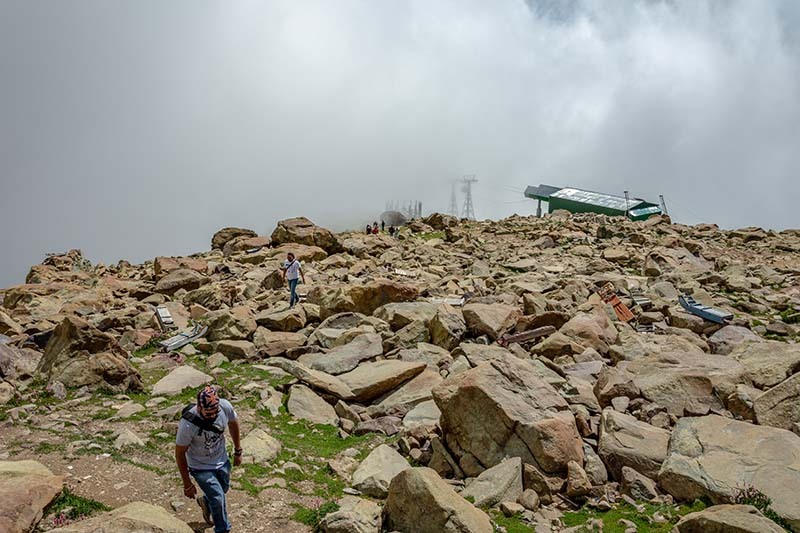 After a ride of another 10 to 12 minutes, we reached the Gondola Phase 2 station at the top of Alpather peak. An even bigger surprise awaited me here. I had the thought of asking for a guide here thinking that they will just ask a couple of hundred bucks to bring us to the lake. Imagine my surprise when I was asked for Rs. 2,500 for showing the way to Alpather Lake. The guides then continued to pitch to us, and to another couple that arrived a little later. They kept using phrases like “Kahan ja rahe ho, kho jaoge, vahan Army ke kutte hain kaat lenge, akele pattharo mein kaha ghusoge” etc. For a minute there, we fell to their tricks and agreed but the price I quoted this time was Rs. 700. The audacity that these people have is that they did not agree for a Rupee less than 2,500. My advice again is to avoid these guides like a plague. They have nothing to offer and ask for an outrageous amount of money. Finally, we gave up the idea of the guide and started to trek on our own. From the knowledge that we have gathered so far, we knew that the lake is somewhere to the right so that is where we went. The only problem was that to our right was a steep climb towards the top of Apharwat peak and it was full of huge rocks. So yes, the trek was definitely not going to be an easy one. That building in the green in picture below is the Gondola Phase 2 station; and we were climbing the mountain to the right. I have continued this travelogue in the next post; Trekking to Alpather Lake – The Hidden Gem of Kashmir. Please click on the link in red to continue reading. Putting all the details and too many pictures on the same page would have just resulted in a heavy and slow post. If you have any questions; please feel free to ask in the comments section below; or at our Community Forum; and I will be glad to answer.